Diva Devotee: [New Music Video] Mariah Carey (ft. Miguel): "#Hermosa"
[New Music Video] Mariah Carey (ft. Miguel): "#Hermosa"
The video that you were all gagging to see has arrived: Mariah Carey and Miguel's new one for the Spanglish remix of #Beautiful(!) That was sarcasm, by the way. Unsurprisingly (and smartly), due to it being a piss-poor remix, the budget wasn't really there for these visuals. But even still, it manages to include staples from the Mariah Carey school of video making. 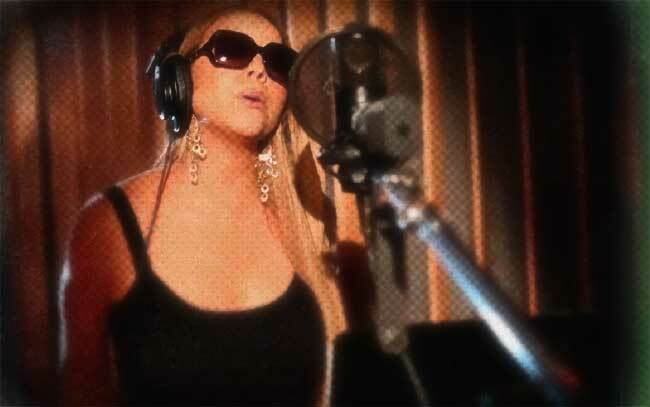 Cue shots of Mariah's shoes/feet/and legs; of her in the studio (because she's a writer and producer, damn it! ); of her spinning gracefully like a beautiful sycamore seed; and her being dramatically seductively! And if those visuals, shot in Capri, weren't enough to dazzle on their own, they've smeared them all in a liberal application of hipster filter to give it that distractingly "vintage" feel. The constant switch between the two language is too weird for my liking. Totally agree with Ricky, the switching between languages makes no sense. No point in that. I really liked this video. I love to hear the Spanish, it in itself makes me feel all "Summer Time!" and I feel it's better than the video for the English version. Yachting through the Mediterranean suits Mariah so much better than driving through the city on the back of a motor cycle. That messes up your hair BIG time dudes! And have you seen Mariah with her hair??? Still totally loving the song as well. In spite of all the horrendous " live" performances of it. PSS:That whistle run at 1:37, just when she jumps into the water, makes it look like she's thinking "hell, the water's too cold! ><"
Spanglish songs really shouldn't be a thing. If you want a Spanish version so badly, then just record an English version and a Spanish version separately. I like this version she looks beautiful and summer like but wish she would release a new song. Well since I'm biligual I didnt find it hard to follow lol and the only reason she pronounced the 'H' is so that you can keep the style of breathy vocals. Once she started belting, the H sound was gone. She knows Spanish, her dad was half Venezuelan and fluent in spanish and with her mother training her classically I'm pretty sureshe taught the vowels of different languages. IDK if there's any truth to this, but I heard that Mariah has a southern american accent, and that could be the diff. Alternatively, it might be that she wants to pronounce it differently because she's singing. For instance, that the silent w in the Japanese wo is pronounced only while singing.